ProtonVPN is one of many successful products of ProtonMail, a renowned end-to-end encrypted email service. Read the rest of the review to learn more about this powerful VPN service. You don’t have to be a nerd to use the service. The developer uses familiar features that supports up to 10 devices. P2P service is common; it uses a kill switch, built-in Tor support, and DNS leak protection. All these features make it easy and convenient to access onion sites thus fast bypass over networks. Apart from Windows, the service is compatible with Mac OS X, iOS, and Android. The apps also come with instruction to help in setting up an OpenVPN. The company does not compromise on security. In fact, it is a fundamental of this service. The servers are only established in 14 countries and access to them is specific under privacy laws. The company privately owns all of the servers in the 14 different locations hence full control over its security features. The company takes responsibility for all nature of breaches and inconveniences to subscribers of the service. It is the sole operator of the VPN, which is connected on a private Internet network owned by the company. The company only supports a single protocol, which explains its focus on security features. All resources are centralized on the OpenVPN hence reliability and efficiency. It probably runs the strongest security features in the industry. Besides the internet protocols and encryption, ProtonVPN has a customized protection feature. Any request of resources and all kind of traffic is routed through several servers across the world before sending it out of the network. It is almost impossible for snoopers to keep up with the traces with respect to source and destination of a resource. The traffic route is irregular; at no point will the resource direction be similar to a previous or next activity on the network. No patterns can be established because of the random system. Also, the VPN service keeps changing encryption keys on every log in. Each session is unique and private for users. However, each key is linked to a specific traffic; compromising one key does not grant access to all traffic, especially with the shifting traffic routes, which makes it impossible. There is a secure package for every budget. The enhanced features are within the Plus plan that includes five devices. The plan is available at $8 per month, which is paid annually. The price is unimaginable compared to other VPNs with the same functionalities and specifications. A basic plan supporting two devices with restrictions on routing traffic through multiple servers is available for $4 per month. Also, ProtonVPN offers a free plan. All you need is sign up and wait for registration process to complete to be assigned a place. Bandwidth is limited ono this plan. Free plan allows one device and restricted access to three countries. The speeds are relatively low but worth the security features and exclusivity. 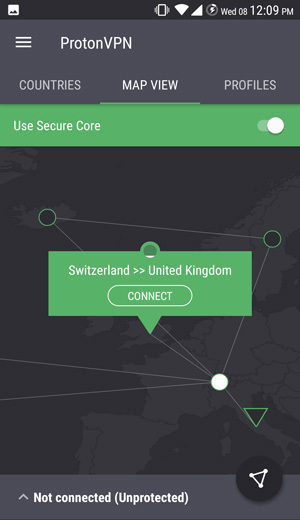 Swiss being home to ProtonVPN is already an advantage to the service. The country is renowned for the strongest privacy laws. It is not controlled by EU and US laws. The country is not among 14 members on surveillance network. It has its own tough rules on data security, which is a plus on the company. As a national requirement not only for public image but also enforcement, ProtonVPN demonstrates that it is a no logs VPN service. It means there is no tracking of internet activity hence no interactions with third parties on any form of data. The company does not store session logins. The only available information is a timestamp of the last successful login, which is overwritten immediately you log in next. There are no records whatsoever. When registering for the service, PrtotonVPN requires you to provide an email address. However, this is only used for unique identification of users. Actually, the company recommends using ProtonMail on signing up to ensure you remain anonymous in your logins and internet activity. The choice is yours when signing up. Users on free plan are not required to provide payment details. Other ProtonVPN plans require payment details of your choice; debit/credit cards or bitcoins. The information is only used for payment. In fact, the company does not access any of a user’s billing details, they are processed a third party. Unlike most VPN services, ProtonVPN uses local Piwik installation to filter out ads. You won’t come across any pop ups on the site or any time you are using the service on your computer. The attention to privacy details with this company is incredible and incomparable. ProtonVPN client is amazing. The interface is professional, creative, and attractive. The interface opens with a detailed world map, which you can easily zoom in and out by spinning your mouse wheel. On the map, the server locations are highlighted. You can easily change settings and location with few clicks. The client account offers more than IP details. You can check the size of data uploaded and downloaded, the download and upload speeds as well as period of connection. The design is simple and unique. Controls are easy to identify by the distinct icons. The icons have direction information for ease of maneuvering. Speeds go up to 30 mbps and lows of 20 mbps, which is way above European and North American servers.